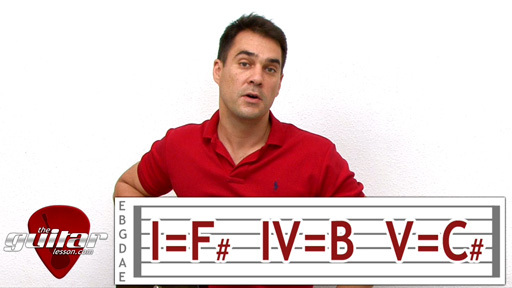 The song is played in the key of F#, and is standard 12 bar blues, so it might help to brush up on your 12 bar blues before you have a go at this one. Now this song uses purely barre chords, so if you're not that proficient with them yet, you might have some difficulties with this song, but in fact, that is all the more reason to learn Give Me One Reason. Learning barre chords is hard at first, but you really need to do it to advance as a guitarist. There is no way around it. Our video guitar lesson on Give Me One Reason will teach you how to play the entire 12 bar blues melody section of the song, just the way Tracy Chapman plays it. You'll also learn a bunch of cool blues licks that you'll hear being used in the song, which will come in really handy in a band situation for example. You also learn how to transpose those licks to different keys towards the end of the lesson, so make sure you watch that part as well.